Product #21204 | SKU 046016 | 0.0 (no ratings yet) Thanks for your rating! 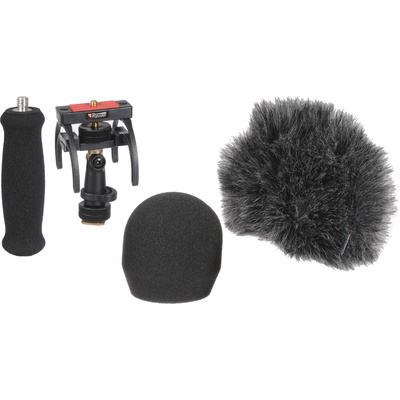 The Portable Recorder Audio Kit for Zoom H2n from Rycote is a combined windshield and suspension solution for noise-free operation of the handheld recorder. The kit contains everything needed to protect against outdoor wind noise and to isolate the recorder from unwanted vibrations, whether from handling or stand-borne noises. The combination is perfect for location soundtracks or outside broadcast, for simple audio podcasts or outdoor radio reporting. Using a 1/4" to 3/8" swivel adaptor, the suspension fits the recorder's 1/4" female thread. The suspension can then be mounted on a 3/8" male thread, microphone stand or boom pole, or be attached to a camera hot shoe. The 180° swivel allows for easy orientation of the recorder. The suspension uses "Lyres" to give excellent isolation and robustness. Unlike rubber or elastic suspensions the Lyre is unaffected by temperature extremes, and can be used in the harshest of environments. Allows recorder to be mounted on a camera hot shoe, boom poles, stands, etc.